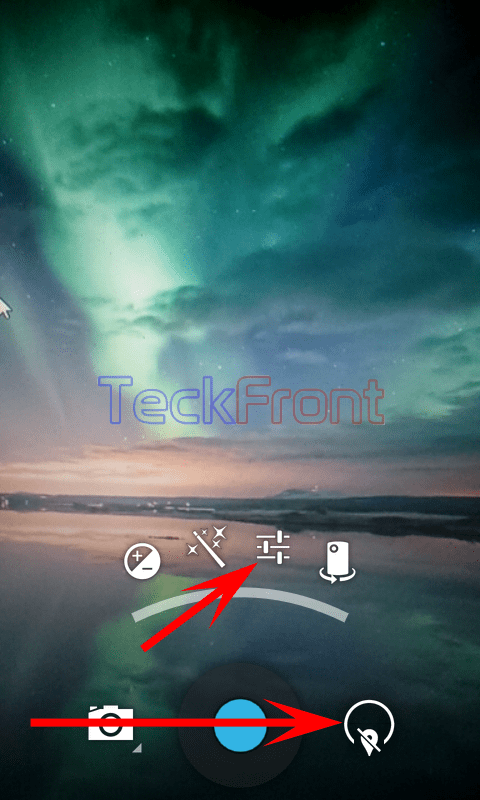 How to Set Countdown Timer of Camera for Auto Snap in Android 4.4.4 KitKat Phone? Sometimes, the camera users of Android 4.4.4 KitKat phone have to apply his/her phone to take selfie – a self snap taken with a digital camera or camera phone – or to take a snap of a group in which he/she is a member as well. This is important to use back-end camera for the better results as the back-end cameras are built with better specs. But, in case of selfie you need to put the camera phone on a stand or tripod. Then there appears the problem; who will take the snap. This problem is solved by Auto Snap. Android 4.4.4 KitKat has solved the problem by introducing the Countdown Timer in Camera app. When the Countdown Timer is set, there will be a little time span, set by you, between the pressing of Camera button and the snap (Auto Snap). This is easy to configure the camera app to work on Countdown Timer to take Auto Snap. Command Line: Camera App > Setting Button > Semi – Floating Settings Menu > Settings > Countdown Timer. 1: Tap the Camera app to open up the Phone Camera of Android 4.4.4 KitKat Phone. 2: Tap the ‘Settings’ button, placed at the bottom right corner of the Camera app. It will open up a semi-floating settings menu. 3: In the semi-floating settings menu, tap the settings button. 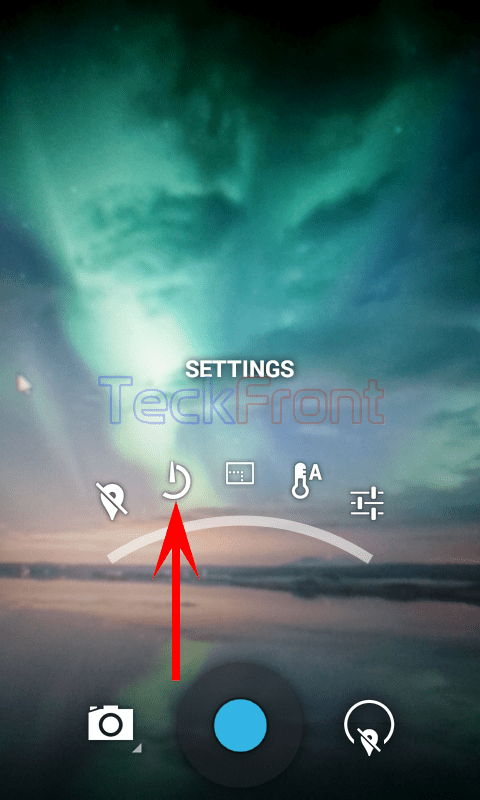 It will open more advanced option buttons of in the semi-floating Settings menu. 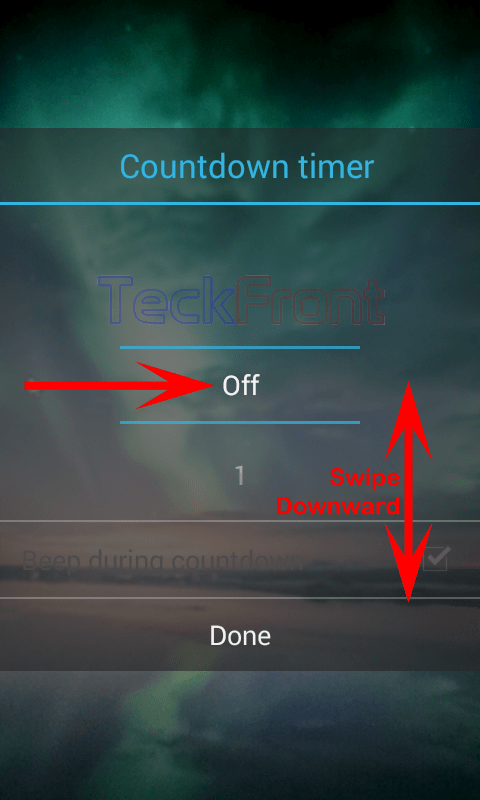 4: Now, do not lift your finger and move it a little upward to the ‘Countdown Timer’ in the extension of semi-floating settings menu to open up the settings interface of the Countdown Timer. 5: See the Timer is ‘OFF’. In the ‘Countdown Timer’ interface, swipe down the timer to reveal that you may set the time span between the pressing of the Camera button and snap to maximum 60 seconds. You may select and set any time for the ‘Countdown Timer’. I selected the 10 second time and tapped done. 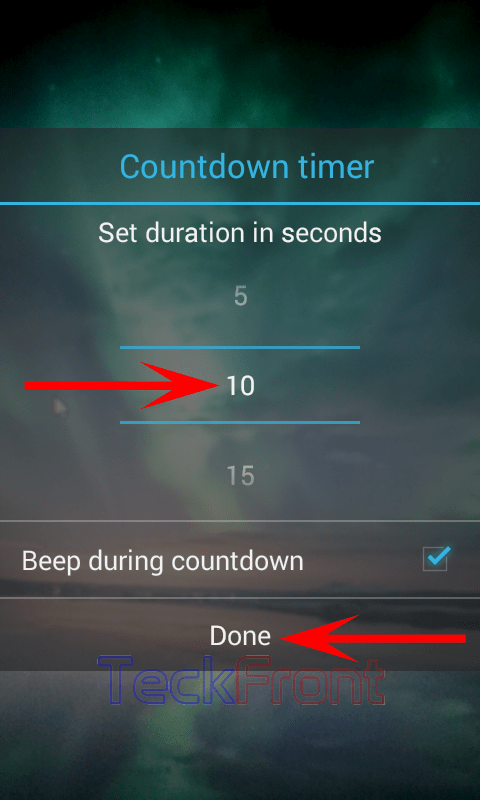 6: See the ‘Beep during countdown’ is checked by default and already enabled. Now, when you will tap the camera button to take snap, time will lapse with beep after every second and after 10 seconds, the camera will take the snap. Newer Download Facebook Messenger v14.0.0.16.14 apk right now – Direct links! Older How to Close Apps, Running in the Background, in Android 4.4.4 KitKat Phones?